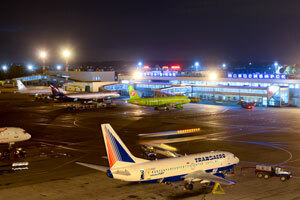 Novosibirsk International Airport – a modern facility serving Russia's third-largest city. 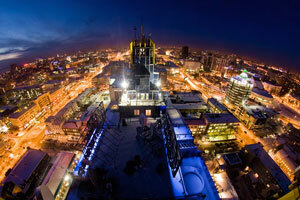 Novosibirsk is one of the largest and fast developing cities in Russia having a population of 1.5 million and 2.69 million in the total Novosibirsk region. Novosibirsk is one of the largest and fast developing cities in Russia located in the south-western part of Siberian Federal District. Convenient geographical location on the cross of the air routes from China and South East Asia to Europe – hidden potential for developing as a transfer hub. Densely populated region (population of Novosibirsk is 1.5 million with 2.69 million in total for the Novosibirsk region), big catchment area. 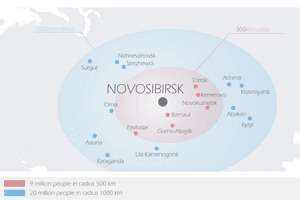 Novosibirsk International Airport’s catchment area (includes big Siberian cities Tomsk, Barnaul, Kemerovo, Omsk and Krasnoyarsk) extends to a radius of 600 km with a population of 12 million people. 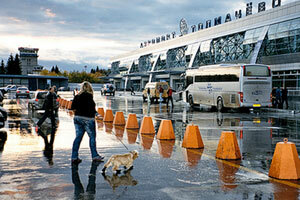 Novosibirsk International Airport is the leader of the Siberian region in terms of passenger and cargo traffic. 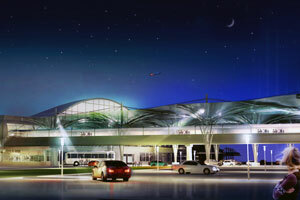 In 2012 the total passenger traffic at the airport amounted more than 3.266 million passengers. 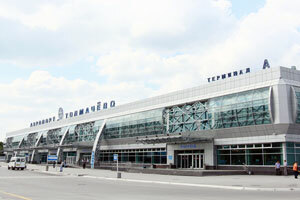 Novosibirsk International Airport has a unique geographical location on the crossroads of one of the most important routes from South-Eastern Asia to Europe and from North America to India and Asia offering optimal positioning for both commercial and technical stops. The airport offers airlines joint promotional campaigns for new route promotion and assistance in the development of awareness and interest about a new destination within the local community using every means within its power. This includes the use of the Novosibirsk International Airport website, cooperation with Novosibirsk travel agencies to sell travel tours and incentives offered to airlines prepared to operate new routes. 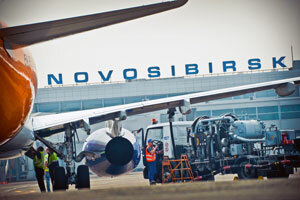 In order to provide support to new airlines entering the market as well as to existing partners starting new routes to/from/via the Novosibirsk International Airport, the airport is ready to provide the airlines with special incentive programs for both passenger and cargo flights. 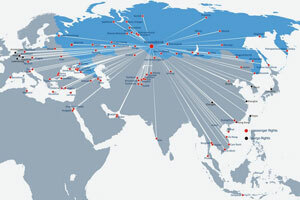 Due to the unique geographical location on the cross of the air routes from China and South East Asia to Europe the Airport has very good opportunities to develop as a connecting hub. 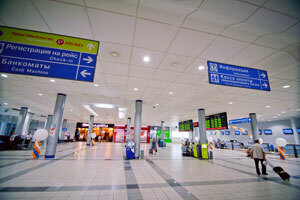 For this purpose the Airport develops a unique transfer project based on cooperation of partner airlines and Russian Transport Clearing House. At present there are more than 10 Russian and CIS airlines already participating in the project and the airport works for inviting even more Carriers. The second important way of development transfer carriages via the airport is close cooperation with base Carrier S7 Airlines & Globus which conveniently connects their own flights at the airport. The third way is individual Interline agreements between the airlines operating via OVB. The Airport on the constant basis analyzes the existing transfer opportunities and advises the airline partners on the opportunity to attract it. 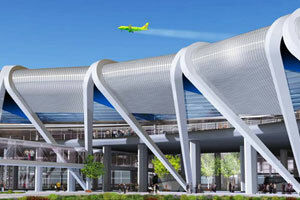 For the purposes of facilitation and smoothing of transfer passenger handling at the Airport a construction of connecting gallery between the Terminal A and Terminal B was started in the end of 2012 which is planned for completion in 2013. 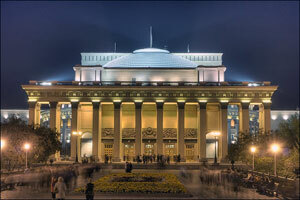 Siberian cities in a 300km radius extend the catchment to 7 million people. 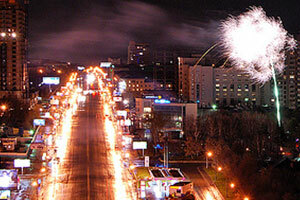 The city of Novosibirsk itself has a population of 1.5 million. The Novosibirsk International Airport catchment area includes the major cities of Novosibirsk, Barnaul, Kemerovo, Tomsk, Novokuznetsk, Omsk, Krasnoyarsk. 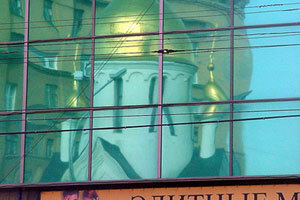 It also spreads over the western part of Siberian Federal District and other areas of the Novosibirsk region. It also includes areas adjoining Omsk Region, Tomsk region, Kemerovo region and Altay territory. 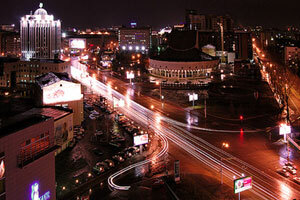 Novosibirsk is a major industrial center of Siberian region. The basis of the industrial complex consists of 214 large and medium-sized enterprises. The leading industries are electricity, gas, water, metallurgy, metal-working, engineering, accounting for 94% of the total industrial production city. Novosibirsk is an intersection of all kinds of transport (river, road, air, and railway) and a convenient transit point for the transportation of cargo for short and long distances. 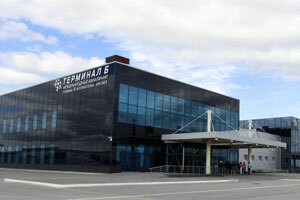 Novosibirsk International Airport has a modern cargo terminal to provide the cargo and mail handling with capacity of up to 50 thousand tons per year meeting Russian and international requirements (including DG handling). Development of the cargo carriages is one of the priorities of the airport. For this purpose a multimodal A-class cargo terminal was constructed in 2007 (phase 1). Despite the global unfavorable economic conditions and significant fall in cargo carriages worldwide in 2008-2009 the airport continued on creating modern airport infrastructure and the second phase of the cargo terminal was put into operation in 2010. 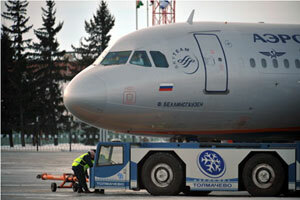 In 2012 the cargo traffic at the airport increased by 29% and amounted more than 28 thousand tons. 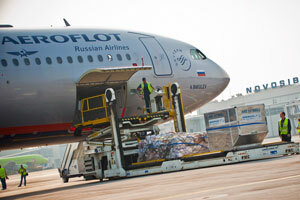 In 2013 the airport expects to handle more than 35 thousand tons of cargo. 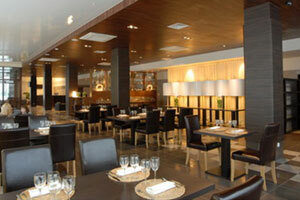 The airport is 17km away from Novosibirsk city center. Other Siberian cities in a 300km radius include Barnaul, Kemerovo, Tomsk, and Novokuznetsk with a potential catchment of 7 million people. 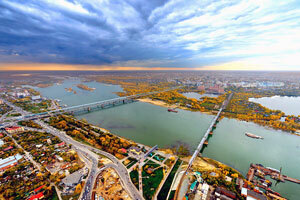 A 600km radius extends this catchment to Omsk and Krasnoyarsk and a 12 million population. 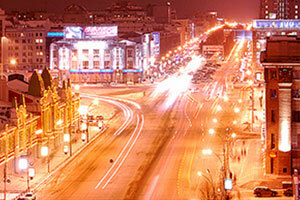 Concentration of air, rail, road and water communications makes Novosibirsk the biggest transport center in Siberia. 62 parking positions for all types of aircraft, 17 equipped with centralized refueling system with the capacity of 900 cubic meters per hour. Min. connecting times: INT to INT 150 min, INT to DOM 150 min, DOM to INT 150 min, DOM to DOM 90 min. Other relevant Infrastructure: upgraded passenger terminals, a four star “Skyport Hotel”, an A class cargo terminal, a new catering facility, as well as the comprehensive employment of new modern ground support infrastructure and apron equipment.